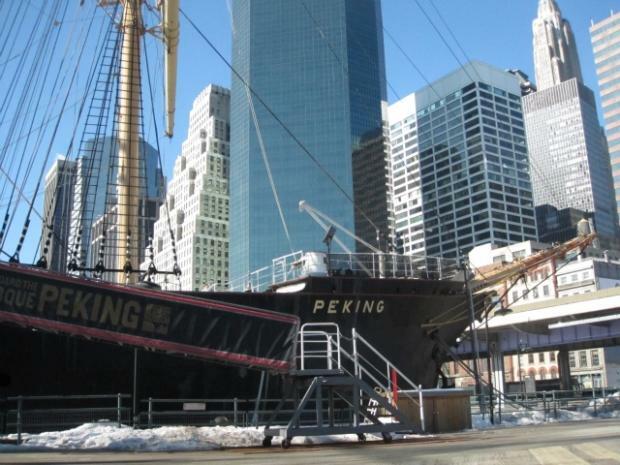 SOUTH STREET SEAPORT — Officials at the struggling Seaport Museum New York backed out of a public meeting at the last minute this week, leaving more than 100 locals who wanted to question them about its faltering future in the lurch. The museum, which closed its galleries and laid off most of its staff in February, was supposed to address the community for the first time since the problems came to light, during a Tuesday meeting of Community Board 1. But on Monday, the Fulton Street museum's chairman wrote to CB1 that the presentation was cancelled. "We regret that we will be unable to attend this meeting," Chairman Frank Sciame and President Mary Ellen Pelzer wrote to Community Board 1 on Monday. "As we are still actively working to resolve various fiscal issues and determine the best strategy for a smooth transition to new leadership, a presentation by the museum would be premature." Museum officials declined to attend a similar meeting in May but promised they would be ready to speak at the next meeting of CB1's Seaport/Civic Center Committee in June, which took place Tuesday night. More than 100 downtown residents and former museum employees and volunteers turned out for the meeting at Southbridge Towers. Many did not know of the museum's last-minute withdrawl. "We want transparency," said Evie Katz, a Southbridge resident. "We have a right to know what's going on there." Laura Nicholas, a former volunteer at Bowne & Co. Stationers, the museum's shuttered 19th-century print shop, said museum officials should not be so afraid of working with the community. "We don't want to just be antagonists and troublemakers," Nicholas said. "We actually do want to help." Nicholas is a member of the Save Our Seaport group, which held a rally last month and is circulating a petition calling for the museum to refocus on its historic ships, rather than on pricey indoor exhibits. Many people said they feared that by the time the museum finally presents its plans, they would be finalized and the community's comments would be irrelevant. "Decisions are going to be made without our input," said Paul Viggiano, a CB1 member. "The city and the museum are going to do what's in their best interest, not ours." While museum officials negotiate with the city over the institution's future, the museum's historic ships are deteriorating because they are not being maintained, former employees and volunteers said. And the few ships that are in good shape and could be bringing in money during the summer season are sitting idle at the dock because there is no one to run them, said Richard Dorfman, former master of the schooner Pioneer. The Seaport/Civic Center Committee passed a resolution strongly urging the museum to meet with the community before making any decisions and asking for more transparency and better community representation on the museum's board of directors.